The Best Places to Rock Climb In The U.S.
Rock climbing is a sport that involves climbing natural rock formations with the goal of reaching the summit, peak, or endpoint. Rock climbing has become more popular over the years, but several people shy away due to the danger. Thus, artificial rock climbing walls in fitness facilities has become more popular as well. These artificial walls provide the climber with similar characteristics of natural rock climbing, but take away the danger aspect. Rock climbing is a great way to improve your overall muscular strength and endurance and it will definitely help you overcome your fear of heights. 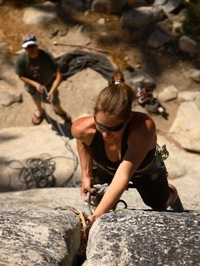 Below are a few of the benefits of rock climbing and best rock climbing places in the nation. Stay safe and good luck! Nutcracker at Yosemite, California: This climb takes around two to four hours with an overall height of over 600 feet. Grand Canyon, Arizona: A must do for the novice or expert rock climber. Ellingwood Arete, Colorado: This spot offers a great combination of rock and mountain climbing with a summit of over 14,000 feet. Disappointment Cleaver/Ingraham Glacier Route, Washington: This climb takes around six to ten hours and requires ice climbing. Mount McKinley, Alaska: One of the hardest and dangerous climbs in the world with a summit over 20,000 feet. Breakneck Ridge, Pennsylvania: Perfect for the novice climber, this area offers over five miles of challenging rock climbing with an elevation of just over 1,200 feet. What’s your favorite rock climbing spot in the U.S.?